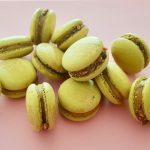 My my my, these macarons may just be my best ones yet! Sure I’d like their ‘feet’ to be a bit more fluffier but I can’t change the conditions in my kitchen right now and that’s just how my recipe came out this time. Truth to be told I started them off as salted caramel macarons and then accidentally dropped in a little too much blue and ended up with beautiful green that just like that inspired the addition of toasted pistachios! And like so many things in life, though it did not turn out the way intended, it became what it was meant to be. Cheers to that and the silky buttery caramel filling that by the way also works beautifully as an insert in a entremet cake. I have not been posting lately but this one is totally worth the share, hope you like it! Before starting off the caramel, heat the cream in a separate small pan or in bowl in microwave and set aside. Caramelize sugar evenly until a nice brown colour achieved, then add the cream and mix until incorporated and smooth. Allow to cool a bit before adding the butter in cubes and add salt. Once all incorporated, pour into a shallow container and cool in refrigerator. Preheat oven to 160°C (320°F). Prepare baking sheet with parchment or silicone baking sheet. Place powdered sugar and ground almonds in a food processor or coffee grinder and pulse for few seconds, then transfer to a separate mixing bowl through a sieve discarding anything that doesn't go through. Combine the finely ground mixture with the remaining egg whites and mix until fully incorporated, then add food colouring of desired hue and mix well. When the meringue forms stiff and glossy peaks remove from mixer and combine with purple almond paste by gently folding using a spatula or a big spoon. Allow to cool before taking off the baking sheet and filling. Once cooled pair for filling, you can apply some edible gold paint on top gently using a brush. 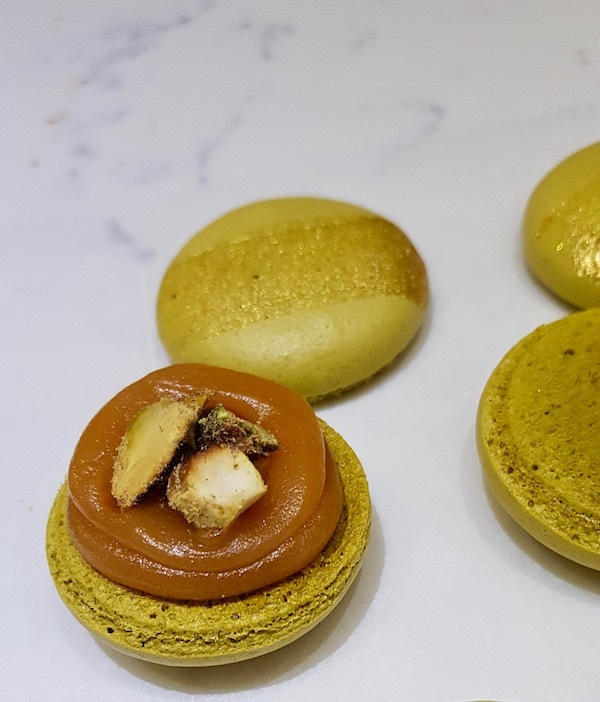 Place the cooled caramel into a piping bag and pipe in a circle on the flat side of a macaron cookie, place toasted pistachios in the middle and then top with another cookie to make into a sandwich. Roll the sides in ground pistachios to attach in the caramel.